After the Arrival at the Conference venue, all Oral Presenters are kindly requested to load their presentation slides onto the computer at least 2 hours prior to their presentation time at the Speakers' Check- In Desk. All presenters (Oral& Poster) are asked to submit a 4-page manuscript to the Presenter's Desk during the Conference. Please refer to the Manuscript guideline, stated under the category "Full Paper Submission" from the link below. Presenters are requested to hold their presentation in English. There will be no translation facilities. 15 minutes are available for each presentation, including Q&A. The chairperson of your session will terminate your talk when the allocated time is up. A data projector is available for use at each session room. We are currently running Powerpoint 2010, 2016 on a Windows 7 PC. Other types of drives and Apple MAC facilities are NOT available. Speakers are asked to bring their presentation file on a USB memory stick. Only PowerPoint slides are acceptable. The use of a personal computer for the presentation is not possible. All speakers should arrive at each the designated session venue 10 minutes prior to the start of the session, after CHECK-IN at the Speakers' Check-In Desk. Speakers are requested to follow the schedule when mounting their posters on their Assigned board. There will be two separate poster sessions categorized by areas. Posters will be displayed on the board from June 19 to June 22 on the 3rd Floor of the conference venue. Presenters are requested to mount and remove their posters during the following period depending on their presentation date. Remained posters after the designated removal time will be disposed. The presentation number (e.g. P-Po-1) will already be posted on the board by the conference staff. Please look for your Presentation number in the Program book and mount your poster on the assigned board. 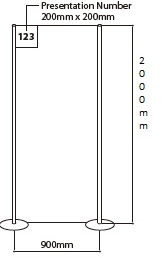 The size of the poster panel board is 900mm (width) x 2000mm (height). Contact details (E-mail, etc.) are recommended for indication on the poster for further contacts. Presenters have to be present and be available for discussion during the poster session. Chairpersons are requested to come to the session room at least 5 minutes prior to the beginning of the session. Presentation are basically 15 minutes long, including Q&A. Please refer to the information sheet which will be handed over in the session room, since some exceptions may occur. Chairpersons are asked to ensure that all sessions start on time and finish punctually as scheduled. Therefore, please guide presenters to keep their presentation in time. An interruption is permitted if necessary. The award, "Best Presentation Prize" is selected in each area from both Oral and Poster, will be announced in the closing session on June 22.